Home-use-only model in great condition! 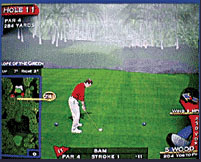 This game features all 29 golf courses with all the available add-in course packs. 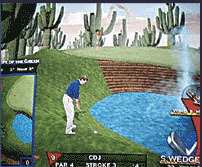 Narrated by sports commentators Pat Sommerall and Peter Jacobsen, this all-time popular arcade golf game features commercial-grade arcade quality construction and controls, and modern realistic graphics, physics, sounds effects, music, and speech, that will do nothing less than blow you away! Hundreds of speech clips/comments from Pat and Peter go along with your shots- listen to the crowd OOH! and AAH! and cheer & applaud as you play. Play the front 9, back 9, or all 18 holes on any course. Professional versions of all courses, and additional amateur versions of some of the more-challenging courses. Play up to 4 players per round. Play a strokes or skins game. Put your initials on the leaderboard. Game keeps track of best scores and course records for all courses, including longest drive, longest putt, birdies, eagles, and greatest shots. View your shots from several angles and watch replays on-demand. Features realistic environmental effects like wind, fog, and light rain. Choose your own club or go with what the computer recommends. Make straight shots, hook shots, slices, and even put backspin on the ball! Be challenged by real sand traps, trees, rough, bushes, and water hazards. Best virtual golf experience and value in golf games for the money- you will not find anything better! This lightly-used and well-cared-for model has been used only in a smoke-free home environment and is still in great condition. No screen burn-in- monitor still has a like-new look with bright, crisp colors. Trackball recently tuned-up and lubricated for like-new use. 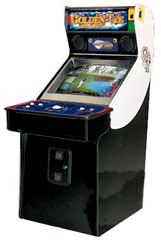 This machine is a FREE PLAY model- does not require coins for operation. Game measurements: 27 wide x 67 high x 43 deep (inches). (36 inches deep with control panel removed).